Even if you remember to check the weather forecast before heading out, there’s no guarantee that a surprise rainshower won’t find you anyway. Weather forecasts aren’t always one hundred percent accurate or custom-tailored to your area -- but what if your umbrella could let you know that you’re going to need it? 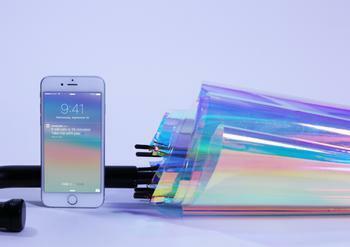 With a smart umbrella called the “Oombrella,” it’s possible. The Oombrella, created by Paris-based company Wezzoo, will notify you through an app on your smartphone if rain is expected in your area within the next fifteen minutes. And because it’s connected to your smartphone, the Oombrella can also let you know if you’re about to forget it. So how can it do all this? According to the company’s Kickstarter, Oombrella uses real-time weather data to help users stay as up-to-date as possible. If you're prone to leaving your umbrella behind, the Oombrella might be just right for you. Other members of the Wezzoo community can help you track down your missing umbrella by combining your location with last-seen data. The creators of Oombrella had a little fun designing the top of the umbrella. A screw thread included on the top of the umbrella allows users to screw in other items -- a camera, a smartphone, or a GoPro, for instance. Oombrella is sturdy, too, with Kevlar ribs designed to withstand high winds and rains. But it’s got more than just brains and brawn. . . it’s got beauty. The Kickstarter campaign is well on its way towards reaching its $65,500 goal by mid-April. Super early birds can snag the Oombrella on Kickstarter for about $66. If you don’t want to spend that much (or if you’ve grown especially fond of your old umbrella), you can purchase just the capsule for $32. Oombrellas will ship in October 2016 if all goes according to plan.